So I’ve been trying to use it at much as possible. But since I only got one, that means I have to share. 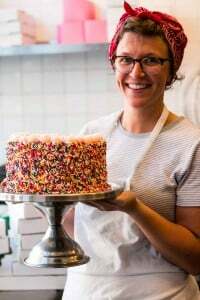 Which is pretty much a good thing when it comes to desserts anyways, as few of us can eat a whole cake, pie, or quart of ice cream. Come the holidays, I start baking up as many desserts as I can – to share, of course. And nothing is better with a slice of apple pie or wedge of dark chocolate cake than ice cream. Vanilla ice cream is the classic, but it’s nice to offer something a little different every once in a while, something perhaps more wintery (although cinnamon goes great with summer fruits, like peaches and plums as well.) Since I’ve been churning up a storm lately, and had some fruit sorbets on hand, I paired my cinnamon ice cream with a few other flavors, to make a nifty trio. Cinnamon can vary in flavor and intensity, and if you want a real kick, try Saigon cinnamon. But rather than rely on origins, or varieties, or labels, the best way to tell if cinnamon is good is to take a big whiff: if it smells good to you, that’s the one to use. I use sticks in this ice cream since infusing them gives the ice cream a fuller, more complex spice flavor. Right before I churn it, I taste it again (and sometimes, again and again and again) and grate a little fresh cinnamon into the custard right before I pour it into the machine, to focus and sharpen the spicy flavor. Adapted from The Perfect Scoop (Ten Speed Press)Although cinnamon ice cream is perfect with apple pie, gingerbread, and even a bowl of sliced fresh peaches, when in season, I’ll often pair it with other ice creams or fruit sorbets, where the gentle spiciness is a nice counterpoint to the fresh fruit flavors. 1. Heat the milk, sugar, salt, cinnamon sticks, and 1 cup (250ml) of the heavy cream together in a medium saucepan. Cover, remove from heat, and let steep 1 hour. What a cute little serving bowl! I LOVE anything cinnamon, and have been toying with the idea of making a cinnamon ice cream in the past. This post has given me just the push I need to make one! I can just imagine how perfect it would be scooped over hot apple pie. Yum! Perfect for fall and into the holidays. Thanks for posting! YUM!!! I don’t have enough time to make all these wonderful things! Apple jelly last week (that turned out the best jelly ever), chicken basteeya tomorrow… cinnamon ice cream on the weekend….. Sounds delicious. I’m going to put it on my list of recipes to make (quickly reaching 200 of them now). I’m thinking I’ll swirl some boiled apple cider syrup in it. That way I’ll always have the apple/cinnamon flavor combo, even when there’s no pie. This ice cream is an absolutely fabulous flavour! Love the dish too! I can’t believe you posted this. I am making the French apple cake you posted a few years ago for a party next week and wanted to serve it with cinnamon ice cream. I read in Dorie Greenspan’s cookbook that is what the woman in Paris who she got the recipe from served with it. 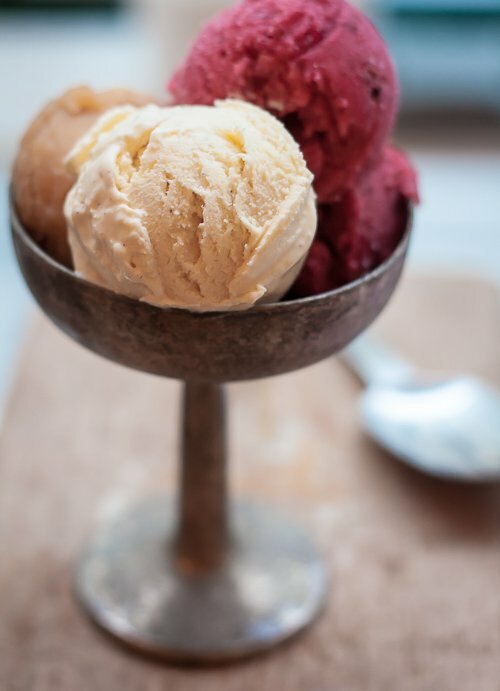 I’ve been trying to decide how I would make the ice cream and now thanks to you I’ve got the recipe….thank you! 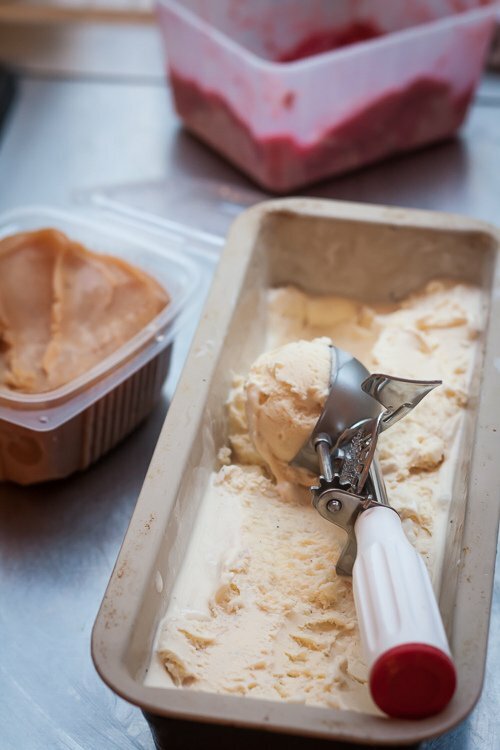 Just curious, what other flavors of ice cream did you put in your gelato dish? I’m wondering what you paired up with the cinnamon. Love the idea of grating a little before churning away. I find the American infatuation with cinnamon and apples cloying, but when I lived in Amsterdam, there was this restaurant called D’Theeboom that had a fabulous house cinnamon ice cream served with warm cherries. Cinnamon is not the first ice cream flavour I would choose but it sounds perfect for this time of year! Perfect timing! I’m planning on making some individual chocolate molten lava cakes and this would be the perfect accompaniment. How could I do this with no ice-cream maker? Looks great! 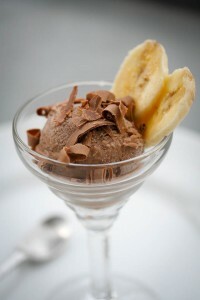 I love your ice cream book and have made many tasty ice creams from it…this one looks really good too! I want it with some apple pie! Earlier today, before your blog post I had flagged your Cinnamon Ice Cream Recipe to go with Pecan Pie for Thanksgiving! Anne Marie: The purple one is plum sorbet, made from Italian prune plums (quetsche) – the recipe is in my book, The Perfect Scoop, too. Jessican: At the end of the post, there is a link to a post I did on how to make ice cream without a machine, which explains it. Fazal: I made this and served it to two French friends for dessert, and one liked it so much that he made it at home the next day. True, we Americans tend to use a lot of cinnamon, but here I find it almost slightly savory, the way that cinnamon is used in Middle Eastern and Chinese dishes – not as a predominant flavor, but as an accent. Especially when served with other sorbets or ice creams. I had some lovely spice ice creams when I visited Barbados some years ago to watch England play the West Indies at cricket. Nutmeg and cinnamon were my favourites, so I’ll definitely give this a go. I love cinnamon and one of my favourite dishes is roast chicken rubbed with paprika and olive oil and stuffed with cous cous which has been flavoured with cinnamon, garlic, whole almonds and butter and served with the pan juices to which some tomato puree, honey and lemon juice has been added. We had it with quails for my son’s wedding. It makes a big difference to moussaka and is wonderful in imam byaldi. And if I quickly cook a Bramley apple to eat with yoghurt, a little butter and cinnamon turns it into a luxurious dish. Question: In step 1 do I heat the mixture until it is boiling? question: is there any substitute steps for an ice cream maker as i dont have one? Oh David I love getting cinnamon ice cream this time of year. It goes perfect with all the desserts at the Thanksgiving table and everyone loves it. I have your book and since I wasn’t thinking ice cream due to our 30F degree temps I didn’t look. Great idea – so much better than store bought. I’m sitting here making out my grocery list, now I’ve got a few more ingredients to add and whip up later today. Thanks for the inspiration. Have a great holiday! Thanks for your terrific blog. I have a quenstion: do you know of a blog with information on food in Rome, like yours on Paris? Thank you for this recipe. I am so happy to hear I am not the only one who buys lonely serving pieces! I have a whole set of mismatched salt and pepper shakers and serving bowls. What a great find. I can’t wait to try the recipe and put the ice cream into some of my own singular collection of ice cream bowls! A whole cake or pie, I agree, way too much for one person. But a quart of ice-cream? Alone? In one sitting? No problem!! Especially if it is a good as yours looks to be. Just saying. It wasn’t until I moved to Mexico that I learned that the cinnamon commonly used in the U.S. is not true cinnamon. In Mexico, the cinnamon we find at the stores is Cinnamomum zeylanicam, also known as Cinnamomum verum (true cinnamon) from Ceylon, (Sri Lanka). It has the appearance of rolled bark. Cinnamon in the U.S. is Cinnamomum cassia. The latter is sharper in flavor, while the former is sweeter and more delicate. Which cinnamon do you find in France, David? David, I miss your longer posts! MaryBeth + Vicki: Thanks – happy holiday to you too! kunnie: Try the blogs of Katie Parla, Elizabeth Minchilli, and Maureen Fant – all write about food in Rome, and the first two have apps on the subject as well. Divya-Ella: At the end of the post, I linked to a post I did about how to make ice cream if you don’t have an ice cream machine. JD: Just until it’s warm is fine. This would be lovely on apple pie. Looks amazing! We LOVE your cinnamon ice cream! David, your ice cream sounds quite exquisite… I want to make this asap. Loved reading about how you bought the little gelato dish… I just picked up a Pillivuyt eared gratin in perfect condition at a thrift store at the weekend for $1! Thanks for always sharing great recipes. Love your work. Good score! I love that Pillivuyt dinnerware and have a bunch of plates. Someone told me that the factory in France has an outlet, which would be fun to visit because new, that stuff is quite expensive. I haven’t been but I saw the address and hours here. That added a kick that was really good. I’m in love with that top photo! You’re work is so inspiring! David, I have Perfect Scoop, which is beautiful, and have ventured to make one thing out of it so far – I was very intimidated by custard-style ice cream as I was sure I would scramble the eggs, and I did! I managed to drag it back from the brink with the help of my food processor, though, and the ice cream (white chocolate) was spectacular. One question I had: I normally make what I think you call in the book Philadelphia-style ice cream (I have the Ben & Jerry’s book, which gives the base for that, and add my own flavours) and I wondered why custard-style seems by most people in the know to be the preferred method? Is it just for health reasons (we don’t have a salmonella problem in eggs in New Zealand so I’m not worried about that), or is the ice cream considered to be a better texture? Custard-based ice creams are considered by some to have a better texture, so that’s what most people prefer. But often for fruit-based ice creams, I don’t use eggs because they can interfere with the taste of the fruit. (Non-custard based ice creams are also a little less intimidating for some folks.) So in my book, I’ve included both, so people can choose. Thanks! I thought it might be the texture because the texture of your recipe ice cream was so divine. I can see I’m going to have to brave the custard again in future. This is a great easy ice cream that is agreeable with everyone. I have made it at least 4 times. I have already whipped up one batch of this and a batch of chocolate ice cream. I’m am now deciding if I should make pumpkin ice cream or white chocolate ginger ice cream to round out the trio. My limiting factor is just the freezing of the ice cream canisters. Yay! I have a thrift… er, heirloom ice cream maker to christen, and THIS is def the right place to start. So many combo possibilities but first, I’m excited to copy the hot choc offered by the café I semi-live in: they float a small scoop of vanilla ice cream in it. Cinnamon will be beyond amazing !!! We’re having a serious debate. I need to triple the recipe for a crowd at Thanksgiving. Should I also triple the cinnamon sticks? I would, but since all cinnamon stick are different (size, shape, origin, and intensity) you’ll need to trust your instincts with what you have. 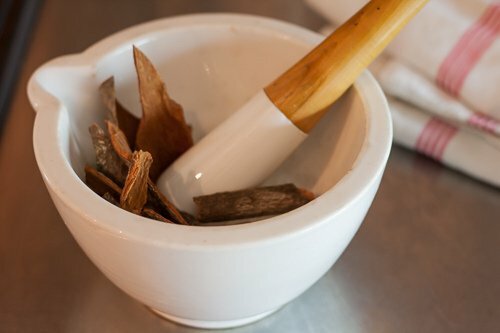 But I’d say use them all – and if it’s not strong enough, you can grind some extra cinnamon in at the end, right before churning. Thanks David, you are right about differences in size and intensity. Maybe you could give us the weight of your 10 sticks, then the only variable will be the quality of the cinnamon being used. I splurged for some beautiful big fat fresh Indonesian cinnamon sticks from Penzey’s so tripling it might be overkill. I erred on the side of caution and went with 17 good-sized cinnamon sticks, about 4 oz. for a triple batch and the cinnamon flavor was strong enough! Te bonus for the cook was rinsing the ice cream maker with brandy and enjoying a creamy delicious cocktail. Yum, can’t wait to try the ice cream withour pecan pie tomorrow. This sounds relish and would go well with Pumpkin Pie! I also love the fact you have used your terrine container to mimic a gelato tray. Look forward to trying it. I saw this post, had all the ingredients and a few hours later my ice cream maker was buzzing away. This was so, so good and such a treat. I can’t wait to have the rest of it tonight with pecan muffins. This is the perfect ice cream for the holidays. I made this the other day and it was very delicious! Oh Thank you David! 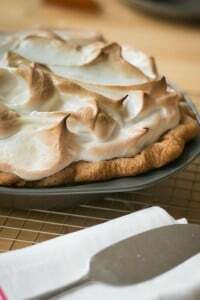 I served this at Thanksgiving on top of Apple Slab Pie (recipe from Tracey’s Culinary Adventures (with Smitten Kitchen’s fabulous crust). This ice cream put it right over the top. I have to make more tomorrow, as I have 1/2 a slab of pie left and the ice cream is GONE! Merci! I made this to accompany pumpkin pie for my American husband’s Thanksgiving dinner. This looks brilliantly delicious. Never seen an ice cream with cinnamon before. After serving cinnamon ice cream atop pecan pie at Thanksgiving we decided that this ice cream needs to be the star of the show rather than an add-on. The day after Thanksgiving we served 2 scoops of ice cream topped with a sliver of pecan pie and it absolutely shined! My challenge for the next batch is to make a simple pecan pie topping. Cinnamon ice cream is my absolute favorite! The ice cream store in town used to make it but it closed a few years ago. I have been suffering ever since. Thanks for the early Christmas present! Love cinnamon! This would taste lovely on top an apple pie or crumble. Thanks for sharing! I love your recipe for this Cinnamon Ice Cream. I am definitely going to try it on my family this holiday season. I especially love your suggestion about infusing the cinnamon sticks with the ice cream to give it a more full flavor. Do you think that this infusion would also add to the delicious aroma of the dessert as well? I NEVER leave comments for anything. But this ice cream has been the best thing to touch my lips in my lifetime. Simply incredible. Texture, flavor, consistency are all spot on. I cannot express how good this is. I almost cried. Thank you for changing my life.